The charming hill station Shimla of Southern Himachal is just 117 kms away from Chandigarh. 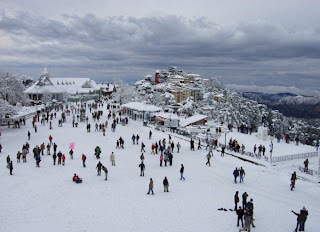 Shimla is the most known spot of summer retreat, and people are reaching to this place from around the world every year. The development and huge tourist attraction made this Himalaya hills more attractive spot for holidays. Many big and branded showrooms at The Mall street are also special, which changed the look of the city. Playing golf at Naldehra and participating in skiing events at Kufri could be different experience for visitors. 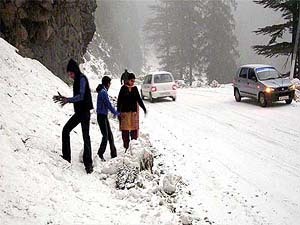 Narkanda and Kufri are nearest tourist spots of Shimla which really continued the charm of the place. The Mall: The mall with big showrooms and quality interior of the shops made this place special. Visitors can walk through and enjoy the beautiful and cleaned place of Shimla. The lined shops, and old colonial building’s combination is also special. Here visitors can enjoy the Scandal Point, at the junction point and the views of the city from this point can be special moment of life. Christ Church with the superior stained-glass windows is also favorite time pass for local people. Gaiety Theatre: The oldest theatre of Shimla is Gaiety, which is situated on Mall road. This theatre was inaugurated in 1887 at the time of Queen Victoria’s anniversary. Going through history of the theatre many big personalities of Indian cinema such as Prithvi Raj Kapoor, K.L. Saigal, Shashi Kapoor, Raj Babbar, Jennifer Kendall, Anupam Kher, Nasseerudin Shah and Manohar Singh have done stage shows in Gaiety theatre. Visitors can enjoy the different evening shows performed by many local and special artists in the theatre. Jhakoo Hill: Shimla is the hill station, so there are lots of hills where people can enjoy. Jhakoo hill is one of them, but this steep climb hill is situated in the east side of Shimla. This highest hill of Shimla is having altitude of 2, 445m. Hanuman Temple at this spot is also special and visitors must reach to this temple. The natural beauty of this hill and the surrounding is the best spot to capture photos. The amazing beauty and forest view from this hill could make the moment memorable. Educational Center of Advanced Studies: Shimla is famous for advanced studies as there are lots of big famous institutes providing best educational background. Shimla was lighted in 1888 with electricity, and it was having the first indoor tennis court of India. However, visitors can only enjoy on Sundays as its not open for visitors on rest of the days. Museum: the nearest visitor spot of the Institute is Museum. It is situated in colonial building in roomy lawns. The collections of stone sculpture, Pahari miniatures, local handicrafts, embroidery and textiles can be seen in the Museum. It can help the visitors to learn the history of Shimla as it contains lots of old memories as well. Toy Train: Shimla is the highest railway station which is connected through toy train provided by the Indian Railway. This train is running with the corporation of Indian railway and Himachal Tourism department. This train was started in 1903 as toy train and still into the service. Local people are using this train as important transport method. The journey of the toy train is from Kalka to Shimla which covers around 20 stations, 969 bridges, 103 tunnels and 919 curves. Shimla toy train is included in Guinness Book of World Records as small wonder of India. This train is the greatest narrow gauge achievement of Indian engineers. Adventure events: Bungee Jumping, Camping, Cycling, Para Gliding, Horse Riding, Safari, Trekking, Skating, Yak Riding, Wild Life are some more exciting options for visitors. Mashobra: this is a village located at 12 km distance. The most demanding hotel at this spot is Wildflower Hall. Tourist can enjoy the trekking and other events in this village as it is situated at the highest peak Shali which is 10,000 ft in height. Naldehra: another spot to visit near Shimla is Naldehra which is just 22km away. The leisure resort Naldehra is best option for accommodation. Some other spots are Golf Course and the cedar forests which are full of natural beauty and green scenery. The charming grasslands make it a lukewarm in the night. Naldehra is also famous for hot sulphur springs known as Tattapani. Visitors have to cover the 28 km distance to reach this amazing spot. Chail: the next place for a tourist is Chail, which is just 45 kms away from Shimla. The world’s biggest cricket pitch of 7,800 ft. and biggest polo ground is situated in this place. Kufri: this is the place having distanced of 12 kms. This half hour distant place is easily accessible through clean roads. The fine forested slopes and a ski-resort at Kufri are special. The Himalaya Nature Park and Indira Tourist Park are best spots of Kufri. The yak and Pony Ride at this place are unique and different experience. Kufri is also famous for winter sports events so that those who are planning to reach Kufri in cold season should not miss the winter sports festival. Narkanda: Narkanda is the last gateway situated at 64 kms distant from Shimla. The fragrant pine forests and winter ski resort is especial spot of this place. The zigzag way with some overwhelming views could be amazing experience for visitors. By Air: reaching Shimla by air is possible as this place is having own airport known as Jubbarhatti. This airbase is situated at distance of 23 kms. Frequent flights from Chandigarh, New Delhi and Kullu are available for visitors. Jagson Airlines is having regular flights from these places to Shimla. 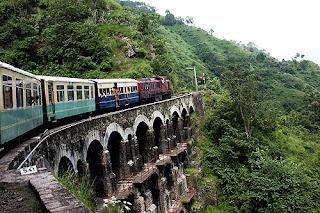 By Train: The closest big railway station which links the Shimla through railway is Kalka. Kalka is just 96 km away from Shimla. The reaching time through train is 6 hours which covers lots of natural beauty and big hills journey. 4 trains are frequently moving from Kalka to Shimla for providing the regular connection with the city. Reaching Kalka from New Delhi will take complete night journey. By Road: this beautiful hill station is properly connected to neighbouring places like Chandigarh and New Delhi through NH (national highways). Approx journey between Delhi to Shimla is 8 hours. The clean and properly managed highways allow the visitors to reach the place easily. Frequent tourist buses and private vehicles are available to reach Shimla through different roads of various cities.